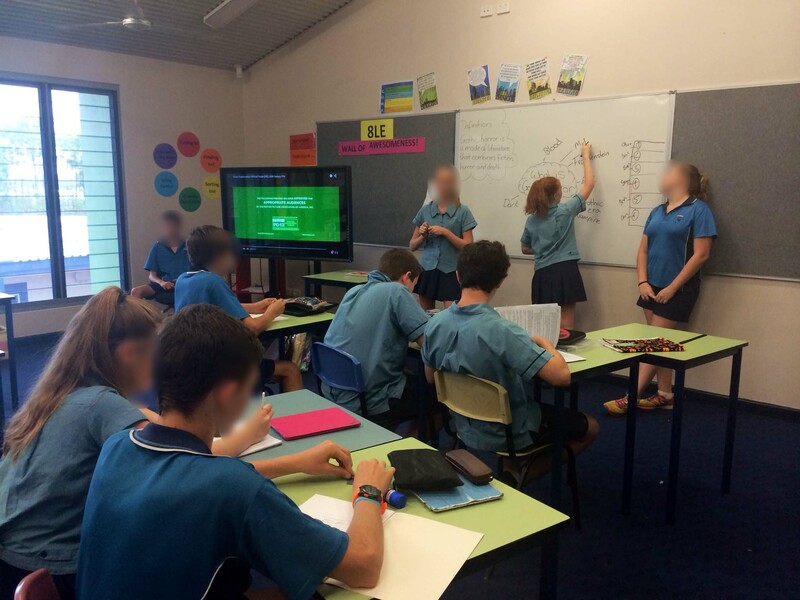 Over the past few weeks our Year 8 cohort have engaged in a genre study inquiry focusing on the horror genre. I decided to try a different approach with my class. Like most middle school learners they are a very energetic and chatty bunch of learners who like to be actively involved in their learning, not just receivers of knowledge. So I collated the significant content that they need to learn and the skills they need to develop in order to produce a horror text of their choice. 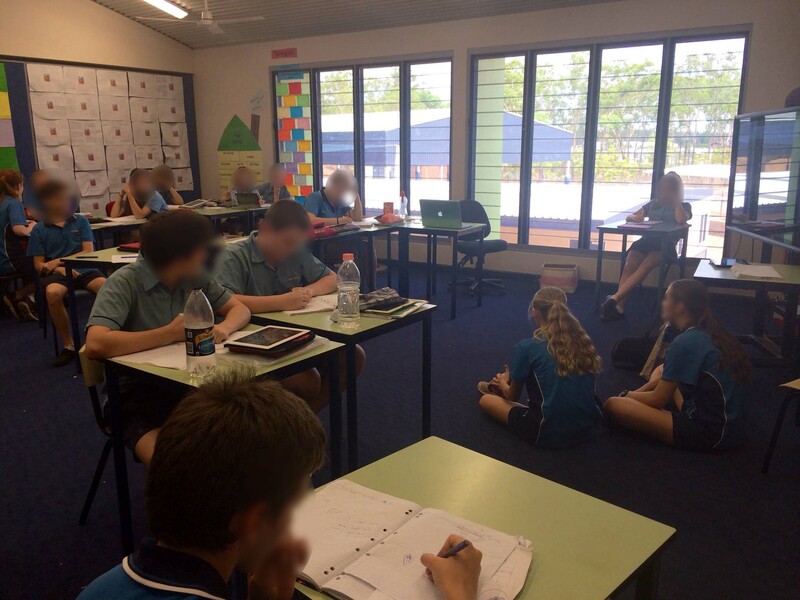 Students then arranged themselves into groups and they were given the task of creating a 30-45 minute inquiry lesson for their peers that enabled them to understand and apply the significant content and skill I had collated and prepared for them. The content and skills were minimal, as I wanted the students to collaboratively inquire and develop their own, collective understandings. Although slightly chaotic at first (my apologies to the two relief teachers who had to cover two of my lessons), the end result was really engaging lessons where students were able to learn the significant content and skills required from their peers. Students help their peers understand the role of gothic horror by conducting an introductory prior-knowledge brainstorm. This ‘students as teachers’ activity allowed me to become a student for a couple of weeks and spend time sitting with my students and simply observing how they both teach and learn. I was able to see learning through my student’s eyes and hear how they learn from listening to their conversations. There is much I will change to my own practice – but that’s a post for later. Students engage their peers in a creative exercise by having them listen to a modern horror story, that includes the features of suspense and the unnatural, and draw the imagery that comes to their mind as they listen. This experience allowed students to bring their unique personalities to the classroom and express this in their learning. I began to realize just how simple, and yet rigorous, student-centered and student-led learning is. When we place the learner at the center of all planning, teaching and assessing our own task as teachers is both simplified and enhanced. We think of the learner, not just the content we need to cover. This led me to think about how I can see the International Baccalaureate Middle Years Programme through the eyes of a student. As teachers and coordinators we spend hours pouring through a plethora of documents to try and make all the Middle Years Programme offers achievable for the context in which we work. There’s the constant struggle of moving forward, without leaving teachers behind and reaching each learning area where they are at, as well as drawing all forward with a common purpose. A very simple way for us to understand the learning areas within the Middle Years Programme could be to see the objectives of each learning area from the eyes of a student. “We understand that through our learning we do not just seek knowledge, but we seek to develop as compassionate global citizens who strive to become the characteristics of the learner profile – inquirer, knowledgeable, communicator, open-minded, balanced, reflective, thinker, caring, risk-taker and principled. In our Arts learning we gain knowledge and understanding of artistic movements and representations. We learn a variety of performing and visual arts skills that enable us to develop as artists. These skills along with our developing knowledge and understanding give us opportunity to think creatively and express ourselves. Through our Design learning we learn to think like designers and solve problems. Through the Design Cycle we learn to inquire and analyse, and using the data from our inquiry and analysis, to develop ideas that solve a problem. In our Design learning we are given opportunities to create solutions and then reflect on the impact of our design through evaluation. Through our Design learning we begin to understand different ways of seeing and thinking. As we engage in our Individuals and societies lessons, through our developing investigation skills we gain knowledge and understanding of famous and influential people who have instigated change and how societies are formed, developed and interact. We then communicate our knowledge and original ideas through our developing critical thinking skills. Through Individuals and societies we gain a deep appreciation of our history and the world in which we live. Language acquisition allows us to begin to comprehend spoken, written and visual text in a language other than our own. Using our new language knowledge and skills we then learn how to effectively communicate in this new language. Language acquisition provides us with an opportunity to communicate beyond our own borders and culture. This learning area helps us develop as global citizens who gain a deeper and broader understanding of our place in the world. In Language and literature we analyse a variety of texts – written, oral and visual. We learn how to effectively organize our ideas in order to produce our own unique text. We learn to use language effectively in order to develop as the best communicator we can possibly be. Language and literature gives us opportunity to gain an appreciation for the power and beauty of language and literature. Through our learning in Mathematics we gain knowledge and understanding of the wonder of mathematics. We learn to investigate patterns and communicate our knowledge of just how we analyse and solve problems. We learn the universal language of mathematics and how to apply our mathematical learning in real-world contexts. Through our mathematics learning we learn how to critically and logically think – a valuable skill we need as individuals committed to a lifetime of learning. Our physical and health education learning area gives us opportunity to gain knowledge and understanding of the problems and issues related to physical and health education. We learn how to plan for performance in a variety of contexts and then apply this plan to our performance. We learn to be reflective learners who understand that there is always room for improvement as we reflect on our performance and think of the ways in which we can improve. In our Science subjects we gain a wealth of knowledge and understanding of the tiniest atoms through to the magnificent scope of our universe. We ask questions and by designing our own experiments we learn to process and evaluate data. We develop as reflective learners through reflection on the impacts of science. Through our learning in science we are given opportunity to explore and be excited about the endless possibilities our world offers us. Our ATL skills are the skills we use to engage in the learning of our subject areas and as we do, we develop each characteristic of the learner profile. We learn to continuously reflect and self-assess and observe how we develop from a novice in a particular skill area through to an expert who can teach this skill to others. Because we learn through a conceptual lens our learning dives deep beneath the facts and content so we can search for the deeper meanings represented in all that we learn. Through our conceptual learning we also learn how all knowledge is transferrable and what we learn in one learning-area can also be applied to multiple other learning areas. Although this is a very brief look at the objectives of each subject group within the Middle Years Programme, seeing these objectives through the eyes of our students can help us realign the purpose of teaching and learning – back to the students. The anomaly of teaching is that in the busyness of planning, marking, giving feedback, communicating with parents and carers, etc., we can loose sight of our purpose and simply begin to tick boxes and aim to just get through the content before the next task, rather than focusing on the students themselves – our reason for teaching in the first place. My students taught me to see learning through their eyes. Not only were each of my students actively engaged, they were able to take ownership of not just what they were peer-teaching, but also of all they learnt, as it was coming from a peer. I have once again been reminded, that we teach children, not just curriculum. Classroom learning should actively seek to listen to student voice and allow for each students unique expression in each lesson.